McDonlad Corporation is the largest fast food restaurant in the world. There are more than 34,000 McDonald's restaurants serving 69 million customers every day in over 121 countries. Geographic area of mcDonald is worldwide and the headquarter of McDonald is in U.S. the current CEO of the company is Don Thompson. According to 2013 the revenue of the company is $ 28,105.7 million and the profit of the company is $ 5,585.9 million. There are more than 1,800,000 employees are working. Competitors of the company are Yum! Brand Inc., Burger King Inc, Subway and Wendy’s Company. 1. Largest fast food market share..McDonald is the largest and rapidly growing fast food restaurant chain in terms of total world sales (8%). It has more than 35,000 outlets and serving 71 million consumers every day in more than 123 countries. 2. Brand recognition valued at $40 million. McDonald is most popular recognized brand in fast food industry and its value is 40 billion dollar. It is also famous and well known due to the Ronald McDonald clown. 3. $2 billion advertising budget. Mcdoland spend 2$ billion dollars in the advertisement which is more than the next 4 fast food chain combined. 4. Locally adapted food menus. McDonald is operating in many cultures where foods are very different form Western countries. Thus providing local tastes to customers is strength of mcDonald. 5. Partnership with best brands. 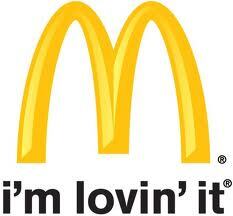 McDonald offer only most popular brand in its restaurants like: Coca Cola, Heinz ketchup, Dannon Yogurt, and others. 6. Children targeting. mcDonald successfully targeting young children through providing them playground, toys with its advertisement and meals. 1. Negative publicity. McDonald is heavily criticize to offering an unhealthy food like burgers and fries to its customers that stimulate obesity and strong marketing focus on children. 2. Unhealthy food. The menu of the company is formed of unhealthy drinks and meal. 3. High employee turnover and Mac job. Mac job is low skilled and low paid job which is seen negative by the company employees. Its result is lower performance and high employee turnover. 1. Demand health food. McDonald may add a healthier food in menu it may make food more comfortable to health. 2. Home delivery. McDonald could try and employed the opportunity of deliver food to home and increase its reach. 3. Full adaption of new practices. In 2006 McDonald is redesigned its restaurant and logo design the introduction of a new practice the restaurants have seen 9 to 10% higher in the market growth. McDonald should adapt the best practice in restaurant as soon as possible. 4. Changing customer behavior and new customer groups. The changing of customer habit present new need in businesses so far the company is very successful to introducing its MacCafe, McExpress and mcStop restaurant. 1. Saturated fast food markets in the developed countries or economies. In the developing and developed countries the fast food market is already overcrowded by many fast food restaurants mcDonald is barely grew through 2012. 2. Trend towards healthy eating. Government and other organization attempt to fight against unhealthy eating trends so the people are becoming more conscious to eating healthy food as compare to fast food. 3. Local fast food restaurant chains. Local fast food restaurant can offer you menus that exactly represent the local tastes. 4. Currency fluctuations. The profits that are sent back to US have to be converted into dollars and it always affected by the exchange rate, for example when the dollar is appreciating against other currencies of different countries. McDonald Corporation profit was largely affected by appreciating dollar in 2012.